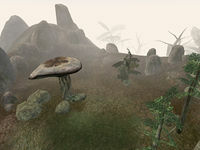 Odai Plateau is the site of the stronghold of House Hlaalu southwest of Balmora and east of Hla Oad. You can just follow the Odai River, past the rope bridge and the Shulk Egg Mine. It is on the west bank of the Odai River. The Odai Plateau is also the site of the Hlaalu stronghold, called Rethan Manor. It is by far the most easily accessible stronghold, as it is relatively close to Balmora and Hla Oad, which makes it a good place to store loot. Also, if you joined House Telvanni or House Redoran, you can get a quest to kill Raynasa Rethan in Rethan Manor. There is an ebony shortsword that is stuck underneath the surface of the plateau. This page was last modified on 15 November 2018, at 21:28.